Occasionally I make an oil painting with knives using the 'wet into wet' technique. 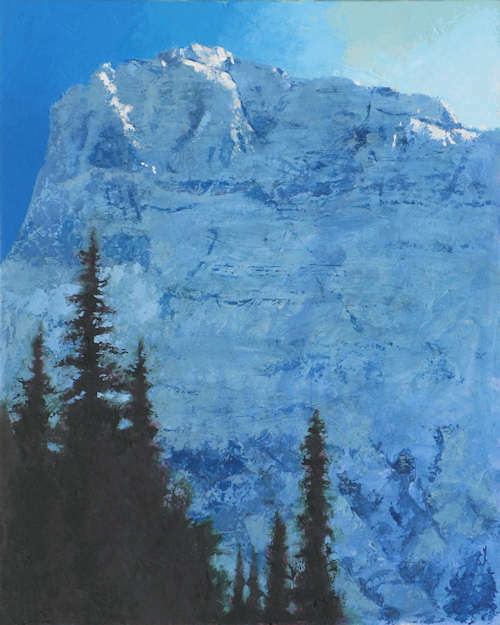 By using a knife it is possible to layer wet paint on top of wet paint without disturbing the layer underneath, thus maintaining a freshness in the painting. 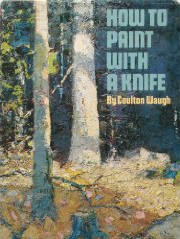 Knife painting automatically keeps your colors pure because it is so easy to keep the knife clean. A quick wipe of the cloth does it and no solvents required! 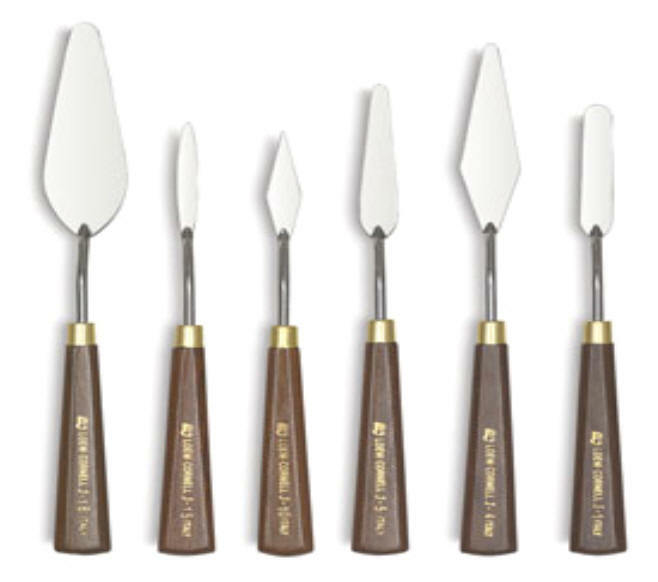 Knives are ideally suited for use in oil paintings of architectural subjects or for anything which is man made. 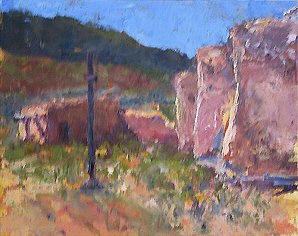 With some subjects a small amount of detail is completed with a brush. 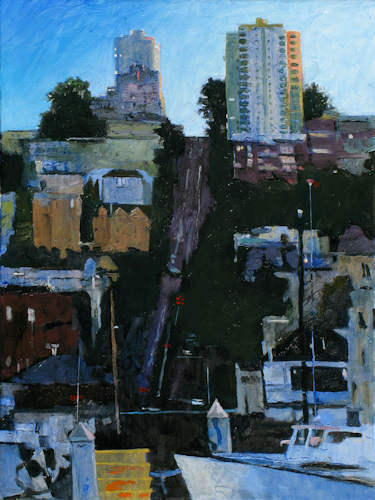 I often begin with the sky for a landscape, completing the painting as I work down to the bottom. 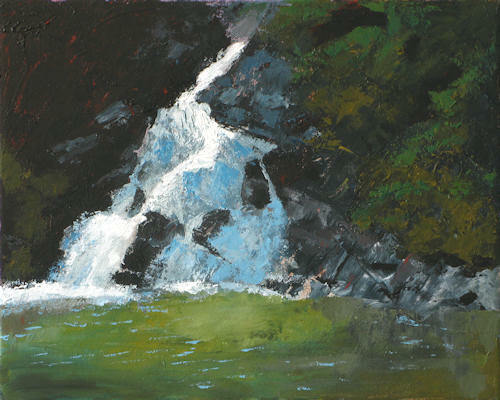 By using the texture of the paint detail can be conveyed, such as rugged mountains, trees and rocks in a landscape or rough seas in a maritime subject. 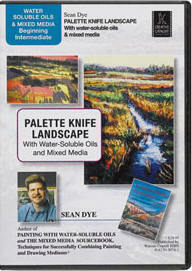 A palette knife is used for mixing paint on the palette and not for actually applying paint to the canvas. The blades on the ones used for painting are usually made from forged steel and are very flexible. The handles are made from hardwood and the blade should extend completely through it. Of the three types of knifes that I usually use, one is straight and flat. This is used for rapidly filling in the large areas of paint on the canvas by holding the blade almost flat to the canvas. It is also used for creating straight lines on the canvas by holding the blade at an angle of 90 degrees to the canvas surface and for blending large areas. The other knifes are much smaller and have a cranked shaft with a diamond shaped head and a tear drop head. The head is offset from the handle to prevent the artists fingers being dragged through the wet oil painting. I use these knifes to add details and relief to the work. 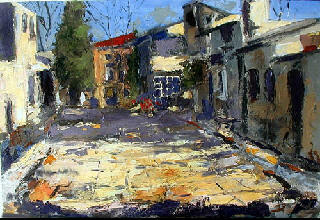 See some great palette knife paintings by Jim Larimer. Fisherman's Wharf in San Francisco.